Contributors. Preface. Purification and Reconstitution of Drosophilia g- - Tubulin Complexes. Using Rapid Freeze and Freeze-Substitution for the Preparation of Yeast Cells for Electron Microscopy and Three-Dimensional Analysis. Digital Fluorescence Microscopy of Cell Cytoplasts with and without the Centrosome. Methods for the Study of Pericentrin in Centrosome Assembly and Function. Molecular Dissection of Yeast Spindle Pole Bodies by Two Hybrid in Vitro Binding, and Co-purification. Genetic Analysis of Yeast Spindle Pole Bodies. Methods for the Study of Centrosomes in Drosophilia during Embryogenesis. Methods for Identification of Centrosome-Associated Proteins. Reconstitution of Centrosome Microtubule Nucleation in Drosophilia. Reconstitution of Centrosome Microtubule Nucleation in Spisula. In Vitro Approaches for the Study of Microtubule Nucleation at the Fission Yeast Spindle Pole Body. Gamma Tubulin and Microtubule Nucleation in Mammalian Cells. Gamma Tubulin in Plant Cells. Centrosomes and Parthenogenesis. In Vitro Approaches for the Study of Molecular Motors in Aster Formation. Methods for the Study of Centrosome-Independent Spindle Assembly in Xenopus Extracts. Methods for the Study of Centrosome Reproduction in Mammalian Cells. Centrosome Reproduction in Xenopus Lysates. Centrosome Reproduction in Vitro: Mammalian Centrosomes in Xenopus Lysates. Identification of Centrosome Kinases. Methods for the Analysis of Centrosome Reproduction in Cancer Cells. Isolation of Centrosomes from Dictyostelium. Index. Volume in Series. Containing a comprehensive collection of convenient and quantitative methods for studying centrosomes, spindle pole bodies and related organelles, this text is a valuable resource for researchers and others interested in studying the role of these organelles in cell replication. Chapters outlining the role of these organelles in other cell functions are also included, and a wide variety of experimental systems for analyzing these organelles are presented. Detailed protocols for experiments are contained in each chapter for researchers to perform in their own labs. 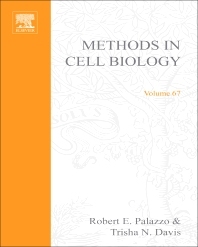 This volume outlines key methodologies used to analyze centrosomes and spindle pole bodies, their replication, and reproduction in the clear, well-illustrated style of the Methods in Cell Biology series. Researchers and graduate students in cell biology, developmental biology, genetics, and cancer research. Academic and research libraries, pharmaceutical and biotechnology companies, and private research facilities. Department of Molecular Biosciences, University of Kansas, Lawrence, U.S.A.